The bx_stereomaker is designed to make stereo signals out of mono ones. According to the boffins at Brainworx it creates a virtual stereo signal by using analogue-style filters. This then enables you to solo this virtual stereo signal and tweak it. The overall goal is to help in both making mono signals stereo, while allowing the producer to balance the centre of the stereo signal, paying particular attention to the frequency range. 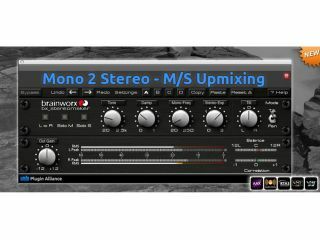 bx_stereomaker is part of the new Brainworx Rock 'n' Roll line and will be available from 27 August 27 2012 for $129. bx_stereomaker is part of the new Brainworx Rock´n´Roll line. It will be available individually or as a part of the Pro version of bx_rockrack!